This is the Pinnacle of auto wash tools! Innovation is the cornerstone of Pinnacle Natural Brilliance. That’s why the Foamaster Foam Wash Gun is a perfect addition to the Pinnacle family. The foam gun delivers the shampoo to the vehicle in a clinging, rich foam that provides ample lubrication as you wash. The Pinnacle Foamaster is a modern improvement on an old idea, and that’s what Pinnacle has been doing for more than 15 years. If you’re a detailer in search of the perfect swirl-free car washing technique (aren’t we all? ), then you’ve come to the right place. My staff and I are constantly reading up on the internet and consulting detailers to see what new tools and techniques are out there. Our latest find is the Foamaster Foam Cleaning Gun. The idea behind a foam gun is to minimize the amount of rubbing and scrubbing necessary to clean the vehicle by pre-soaking it with frothy foam.The foam starts loosening and lubricating the paint immediately. As you work your way down and around the vehicle with a mitt or sponge, you don’t have to use as much force to remove dirt and debris. It’s already loose and just needs slight agitation to release it from the paint surface. We compared several guns and found that the Foamaster is the best for car washing. It creates a substantial amount of foam by forcing water through the nozzle where it mixes with the diluted car shampoo that is in the gun’s reservoir. The foam is richer, thicker, and sticks to the vehicle longer than soap applied by hand because the dilution ratio of the soap is higher. Many detailers we talked to use the Foamaster as they wash with a mitt or sponge, instead of as a pre-soak, or sometimes in addition to a pre-soak. This technique involves spraying the foam directly in your mitt’s path. The foam is its frothiest upon contact so this method ensures a thick, sudsy layer of foam between the mitt and the paint surface. If you use this technique, just take care to avoid hitting the nozzle on the paint as you disperse the foam. Since you’re using both hands, this takes a little coordination. Practice makes perfect! The Foamaster’s nozzle is constructed of brass, giving it excellent, long-lasting performance and durability. The handle, foaming tip, and reservoir lid are all made of heavy duty plastic, and the reservoir itself is chemical resistant polyethylene. 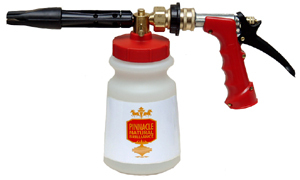 This industrial grade foam gun is used by more detailers and enthusiasts because it’s built to last. I recommend using McKee's 37 Xtreme Foam Formula Auto Shampoo in the Foamaster Foam Wash Gun. This shampoo is literally made for the foam gun with hyper-foaming cleansing agents and rich lubricants. As always, use a paint-safe wash tool such as a Pinnacle Chenille Wash Sponge or a Sheepskin Wash Mitt. I hesitated to buy a foam gun for a long time...don't make the same mistake I did. This thing is great. It is well built (some parts from China, some from USA) and does the job more than well. I would recommend anyone washing a vehicle to get one. It has saved me a bunch of time and when paired with a quality soap, has cut down on my wash time immensely. In my own opion, I feel that the car wash companies don't clean their water recycle filters very often. I got tired of the car looking like crap the next day. Years ago, I had a car washer wand with a soap dispenser. I would not find one at the lovsl stores. Since I have good luck with Autoyopia with other items, I decided to try this out. O man, it is the best. Very easy to use. With the small jet stream, you'll get junk it of places you thought were taken care off a the car wash. It works great on door jams. You will get a long lasting shine. This is the best. Don't forget to get extra soap. Ive only used this foam gun once but so far its great. I love being able to spray soap onto the car before touching the paint. I feel its a lot safer this way. The foam gun worked as advertised. It has a large enough canister to hold the soap. The slide to set the soap : water ratio seemed to work well but I havent tried all the settings yet. Overall its solidly built and I expect to have years of use from the foam gun. I look forward to washing my cars again to see how well it works.